When I first saw the Nokia Lumia 900 ($100 with a two-year AT&T contract, price as of April 3, 2012) at CES 2012, I proclaimed that it was the Windows Phone I’d been waiting for: Offering a premium design, a high-end camera, a gorgeous display, and LTE data speeds, the Lumia 900 seemed to be giving Windows Phone the hardware it deserves. After spending a few days with the Lumia 900, I still stand by that statement. But is the Lumia 900 enough to convert Android and iPhone users into Windows Phone fanatics? I think it has a fighting chance--if AT&T and Microsoft can convince customers that Windows Phone is a competitive platform. The first Lumia phones we saw sort of fulfilled my wishes. The Lumia 800, the flagship phone for Europe and Asia, had that signature high-quality yet durable Nokia build, but the display seemed a bit small. It lacked a front-facing camera, too, even though the Mango update for Windows Phone adds support for dual cameras. Enter the Lumia 900: To create this model, Nokia learned which phones were doing well in the United States, and refined and added to the Lumia 800 so that it could be competitive. The company bumped up the 900’s display to 4.3 inches (from 3.7 inches), tossed in a front-facing camera, and--possibly the best addition--introduced support for AT&T’s speedy LTE network. The Lumia 900 beautifully showcases the Windows Phone operating system. Similar to the Lumia 800, the 900 has a single injectable polyurethane matte-plastic build, which gives it a sturdy feel. The material is soft to the touch, but resistant to scratches (although not necessarily fingerprints). And the phone doesn't feel as if it will completely shatter if you drop it. The Lumia 900 will come in black, white, and cyan. Sadly (well, for me), it won’t have a magenta version, as the Lumia 800 does. Overall, the Nokia Lumia 900’s design makes it stand out from the legions of black rectangular phones, yet it also feels high-quality--a trademark of Nokia phones of the past. One thing to note is that the battery is not removable, and you’ll need the included key to open the door to the SIM card. And like all Windows Phones, the Lumia 900 does not have expandable memory; it's capped at 16GB of internal memory. The good news is that buying the Lumia 900 also gets you an account on Microsoft’s SkyDrive service, with 25GB of free cloud storage. The Lumia 900 has three touch-sensitive navigation buttons--back, home, and search--built into the glass of the display. All of the other buttons you’ll need are situated on the right edge of the phone; the power button sits in the middle, flanked by the volume and camera keys. Perhaps I'm being nitpicky, but the button placement doesn’t really work for me. Because the camera key and the power key are the same size, I kept hitting the wrong button accidentally. I’ll take a physical camera key any day (especially one that unlocks the phone directly into camera mode), but I wish the power button sat on top of the phone to prevent confusion. The bold, bright colors of Windows Phone look smashing on the Lumia 900's ClearBlack Super AMOLED display. But like many AMOLED displays we’ve seen, the Lumia 900’s screen is a bit oversaturated--in our color-bar test, the color gradients bled into one another. Skin tones look a little pink, too, though color accuracy is good overall. Whites look bright, while blacks are deep. 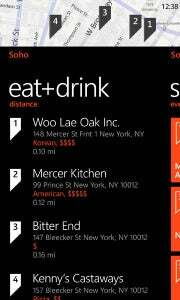 Text is sharp and easy to read in the menus (part of the nice, clean design of Windows Phone OS), as well as in websites. In addition, the display is slightly curved, which is meant to provide good viewing angles and reduced glare. 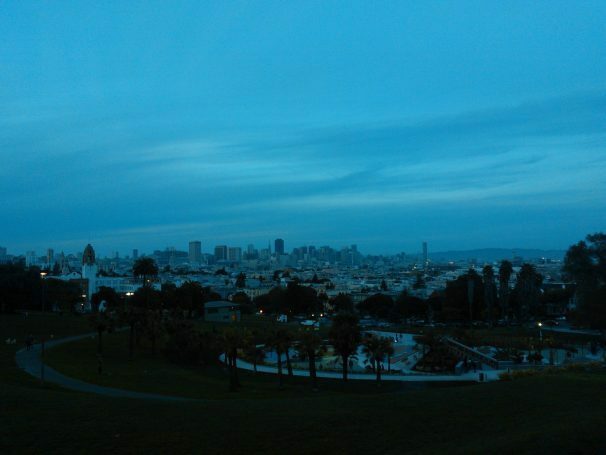 However, when I used the Lumia 900 outdoors, I found that the curved display did little to alleviate the sun’s wrath and improve the phone’s visibility. It was hard to see a picture after I took it, and viewing maps was difficult. Screens with black backgrounds and light text were easier to see in bright sunlight. I've covered the new features in the Mango update quite a bit, but I'll briefly review some of its best features here. For the most part, in looks and behavior, Mango is similar to the first version of Windows Phone 7, but it offers some significant additions. In Mango, you finally get true multitasking with third-party apps, as well as Internet Explorer 9. You can quickly switch among recently used applications by pressing and holding the back button. All of your open apps elegantly display in chronological order based on when you last used them. 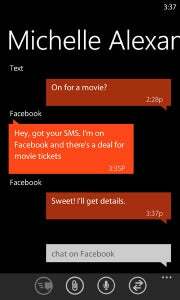 In the messaging app, you can easily switch between SMS, Facebook chat, and Windows Live Messenger within the same thread. This concept sounds helpful, but I don't use Facebook chat or Windows Live Messenger. For me, at least, AIM or Google GTalk integration would be much more useful. All of the Hubs are enhanced. For example, the People Hub collects Facebook, LinkedIn, Outlook, Twitter, and Windows Live Messenger in one place, so you don't have to jump from app to app to communicate with your friends and colleagues. You can also group and categorize your contacts based on how you regard them--friends, coworkers, enemies, or whatever. You can sync multiple email accounts to your Windows Phone, but in order to download apps from the Windows Marketplace, you must create a Windows Live account. I had some trouble syncing my Gmail account on the Lumia 900. I added my account successfully, but my inbox appeared empty, even though I tried resyncing it multiple times. I sent myself a few test messages, which showed up in my inbox on the Lumia 900, so I knew that I was at least receiving mail. Still, none of my older email messages or folders appeared on the phone. I tried syncing another Google account, however, and that synced all of my folders and older email. The Bing search engine received a complete makeover. A new feature called Local Scout uses GPS to recognize where you are, and then provides you with hyperlocal search results according to your preferences. If you want to find a restaurant, for example, Local Scout lists restaurants in the Eat+Drink guide that lie within a 25-mile radius of your current location. The Lumia 900, like most carrier-subsidized smartphones, also has its fair share of added software--or bloatware, as some people might say. From AT&T, you get AT&T Code Scanner, ESPN, Navigator, Radio, U-verse Mobile, YPMobile, and MyWireless (which is actually useful for paying your bill). From Nokia, you get an App Highlights “app,” which essentially showcases featured and staff-recommended apps from the Marketplace, as well as Tango Video Calls. Fortunately, you can easily remove these apps. Unlike Android, Windows Phone lets you uninstall apps directly from your apps list rather than going through a bunch of menus in the settings; you simply hold down on the app, and then you get the option to either uninstall it or pin it to your home screen. Interestingly, Nokia’s navigation app, called Drive, is not preinstalled on the phone, but you can download it from the Marketplace under the designated 'Nokia Collection' on the Marketplace home screen. Windows Phone has a simple navigation system and a lightweight feel, and as a result its performance seems smooth and snappy. Some of the negative comments regarding the Lumia 900, as well as Windows Phones in general, note that the platform doesn’t yet support dual-core processors. But in my hands-on tests, I couldn’t see a big difference in performance between a dual-core Android phone and a single-core Windows Phone. In my hands-on use, I found the Lumia 900’s browser adequately speedy. Text- and image-heavy pages such as TheBoldItalic.com and Eater.com loaded up quickly without any issue. A site built entirely in HTML 5, LostWorldsFairs.com, ran perfectly (and looked great on the Lumia 900’s display). When I tested with the BandWidth data-speed measurement app, the Nokia Lumia 900 achieved average download speeds of 13.27 megabits per second and average upload speeds of 7 mbps over AT&T’s LTE network in San Francisco. Those are impressive speeds, on a par with the LTE speeds we’ve seen on Verizon’s LTE network. Call quality over AT&T’s network in San Francisco was good on both ends. One of my friends sounded a bit muffled, but for the most part everybody I talked to sounded clear, with an ample amount of volume. I made a few calls from a windy, busy street corner, and my friends reported that they could hear only my voice--not the gusts or the car horns. We have not yet completed our battery-life tests on the Lumia 900, but Nokia claims that the phone has 7 hours of maximum 3G talk time and 300 hours of maximum 3G standby time. I took a fully charged Lumia 900 on a 2-hour run with RunKeeper and Slacker running over 4G, as well as with frequent stops to take pictures. The phone lasted my entire journey, but I did need to charge it as soon as I got home. PCWorld will formally test the battery life in the coming week. The most exciting feature of the Lumia 900 is the 8-megapixel camera, which has an F2.2-aperture Carl Zeiss lens. 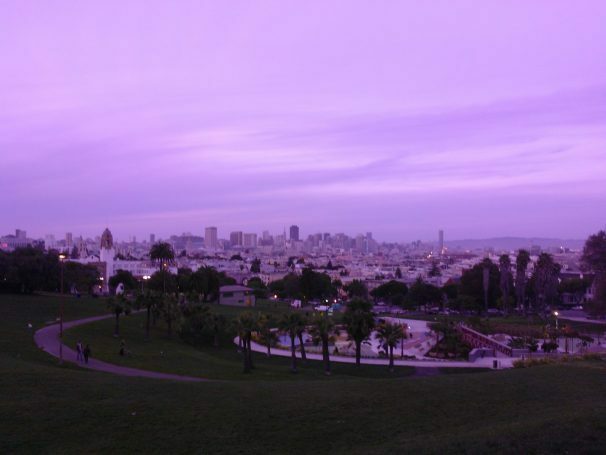 The Lumia 900 also has a dual wide-mode function, allowing you to take wide-angle shots. I took the Lumia 900 on a weekend photo date around the city to see how it performs as an everyday camera. Overall, I appreciate how versatile the camera is in various environments, and the fact that it gives you the freedom to pick from a number of shooting modes and adjust certain controls to your liking. The Lumia 900 takes nice indoor photos when lighting is bright, and gorgeous photos when the sun is shining. 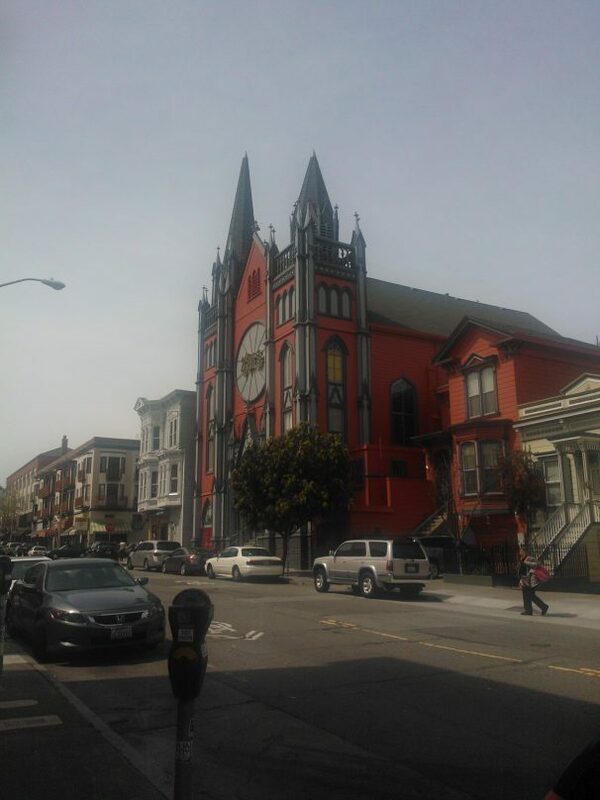 It struggled a bit with the San Francisco fog, as some of my daytime photos came out dark and murky (see the church photo). When the lighting was sufficient, the Lumia 900’s camera photos exhibited remarkably accurate color reproduction. However, I also found that some of the shooting modes add a weird, unnecessary tint to photos. For example, I took the below picture at 8:00 p.m. in three different modes: Auto, Evening, and Night. Though the sun had already gone down, there was still a bit of light out. The Auto mode captured the most accurate colors, while the others added color tints to my photos. Keep this issue in mind as you’re messing with the Lumia 900’s shooting modes. The aforementioned camera shutter key is useful for holding your phone steady while you shoot pics. It didn’t jump to the camera app as quickly as I would have liked, though. I also unintentionally hit the power key instead of the shutter key when I was trying to capture an epic battle between my cats. Not cool. The camera does pretty well with macro images, though as you’ll see in my example, the results lose a bit of detail. Shutter lag, however, is almost nonexistent; the camera snapped photos as soon as I pressed the button. As I mentioned earlier, the Lumia 900 also has a front-facing camera for making video calls. You can use the included Tango app, which has an intuitive, simple interface. Video quality looks pretty good, too. The camera is limited to capturing video in up to 720p resolution due to its single-core processor. Although the Lumia 900 handled motion pretty well in my tests, video looked shaky and colors seemed washed out. I'm also not overjoyed by the fact that Windows Phone still offers no easy way to directly upload your video footage to YouTube. You must first upload it to SkyDrive or email it to yourself, and then upload it from your PC. Competitive specs, a beautiful user interface, and a classy design alone won't turn the world on to Windows Phone and the Nokia Lumia 900. The world needs to be educated about Windows Phone, but thankfully, Nokia, Microsoft, and AT&T are planning a big marketing push for this handset. The Lumia 900 has the chops to stand up to the Android army and AT&T’s other darling, the iPhone 4S, but consumers need to be convinced that Windows Phone can give them everything Android and iOS can--and more. Although the Windows Marketplace is gaining apps every day (the current count is a respectable 70,000 apps), a few essentials remain missing from the catalog (Pandora, anyone?). Also, if you use a lot of Google services, Windows Phone won’t make you very happy. For example, you can’t upload videos directly from your photo gallery to YouTube, and the YouTube “app” is simply a redirect to the mobile YouTube site optimized for Windows Phone--where you still can't upload videos. Google Docs and Google Maps support? Forget it. Microsoft wants you to use its own services, such as Bing Maps, Office, and SkyDrive. If your last phone was an Android handset, going to Windows Phone might be a difficult switch to make. But if you’re not a big fan of Google products, if you already use Bing or SkyDrive, or if you just want to try something new, you’ll be delighted with the Lumia 900. Plus, you can't beat the price. Nokia has done its job, and now it is up to Microsoft and AT&T to win over customers--before it is too late.